Following the ribbon cutting, Mrs. Bowers, Music Teacher, modeled lessons with a class of third-grade students in the piano lab. The program, held in the Multipurpose Room, featured an inspirational performance by Lang Lang Young Scholar, Carey Byron. Ms. Byron has been studying the piano since the age of 4 and has been the first prize winner of several local, state, and international competitions. The Lang Lang International Music Foundation provided Juliette Low with the opportunity to apply for a Keys of Inspiration grant. LLIMF provided a music curriculum developed in collaboration with The Royal Conservatory of Music and supplemental training and ongoing professional support. 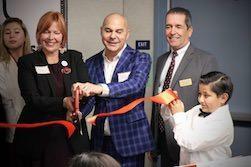 The Henry T. and Elizabeth Segerstrom Foundation provided the magnanimous gift of a state-of-the-art Roland piano lab which transformed an opportunity into a reality. The KOI lab has ignited wonderful things inside of Juliette Low’s second and third-grade pianists. Students have stated that they have learned the importance of perseverance, having a growth mindset, and being focused. Matthew Nguyen stated, “Being a great pianist takes hard work and determination. There is actually nothing that makes me happier than music, and I know that I will be playing the piano for the rest of my life.” Students have spoken of the ways in which learning to play the piano has led to success in other subjects, such as math, creative writing, and keyboarding. Many students state that being in the piano lab is the best part of their day. Most stated that they knew that playing the piano would always be a part of their lives, with some sharing that they would someday like to write their own music. When students reflect on the impact that the piano lab has had on them, almost every student mentions the peace that they feel when playing the piano. Third-grade pianist, Frida Perez, stated, “When I have rough days, I can play the piano, and it will soothe my soul.” This certainly validates the KOI’s goal to encourage students to create music, and through music, help them find a secure space where they can freely be and believe in themselves. The KOI piano lab has opened a new and exciting world to students, and the staff, students, and parents at Juliette Low are filled with the most heartfelt gratitude for this cherished gift.